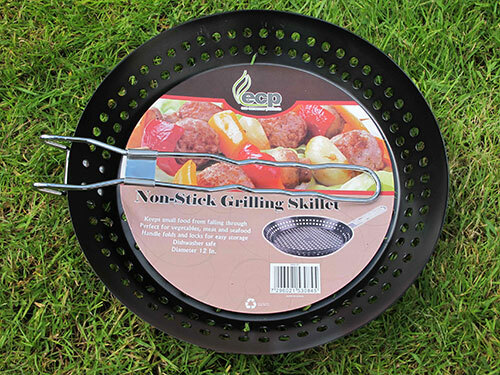 This BBQ pan has been specially designed to fit nicely over the EcoGrill. The perforations in the pan ensure that all the taste of the BBQ flavours your food whilst making sure that small pieces of food are safely held in place. So you can cook chopped vegetables (see our Recipe Blog), Prawns, Fish and any sort of meat quite easily. The only thing that we haven't cooked on it yet is a fried egg! It weighs only 650g so it's light and with it's folding handle it can be carried easily.